Above: These are a series of shots made with the unit pictured below – of a runner jogging down country roads, shot with a Canon 5D MKII and a 24~105mm lens (w/ stabilization turned off on that lens) during the Maine Media Workshops. See a larger version of this video here. I’ve just gotten my hands on a very promising gadget that I think is perfect for anyone using the 5D MKII in a situation that requires external stabilization. The ATM is short for “Advanced Travel Mount” and was designed by Aerial Exposures primarily for aerial and ground based video (i.e. to shoot aerials from a helicopter or plane, or to shoot from a ground-based device such as a vehicle or even a boat.) But something tells me that creative filmmakers will be able to come up with many, many uses for this unit that no one has thought of yet. 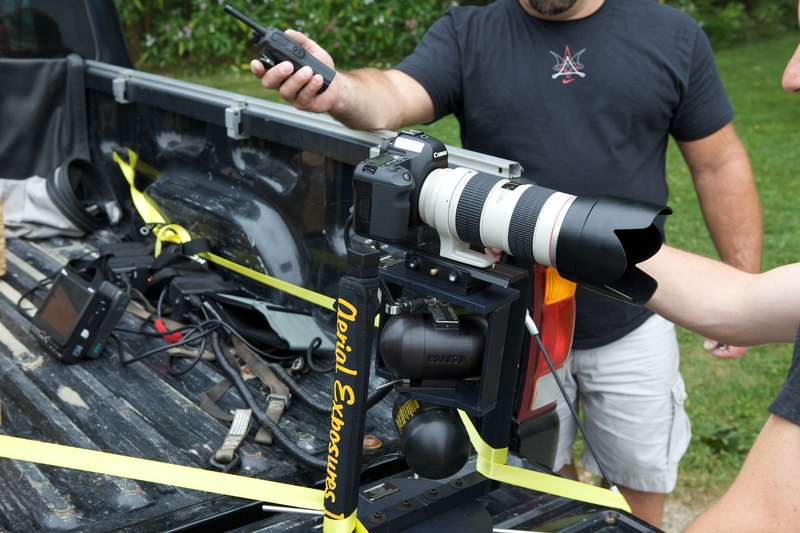 The Aerial Exposures ATM Gyro Mount on the flatbed of a pickup truck as part of class on the 5D MKII at the Maine Media Workshops. I was able to get fantastic results with the 70~200mm pictured above - set to 105mm. The Result: pretty amazingly stable video from a moving car on a bumpy street. On the second example below – you’ll see the trunk gate from the rear of the vehicle we were shooting from violently bounce as the SUV drives over a pothole in the Wall Street area of New York City – notice how the runner stays perfectly steady. That’s a pretty amazing result from a sub $12K unit. I can see this unit being used with vehicles/boats/planes to pull off some pretty high end moves – and I can also see some indy filmmakers finding new ways to use this as a substitute for dolly shots or any shots where you need a rock steady image. Above: Here is another video – this one shot with a Canon 5D MKII as well, a 24~70mm 2.8 – notice how much the rear gate of the SUV moves in relation to the image when the SUV hits a pothole. See a larger version of this video here. And for those that don’t want to buy one – more of these units are becoming available for rent and are extremely affordable compared to other aerial/ car stabilization devices. Some of you may still be shocked at the $12K price tag – but you should realize that the higher end devices are astronomical in price (Cineflex, Spacecam and others) those are are in the $250,000 to $750,000 (and up and up) range. One should note that almost all of the competing devices have to be mounted on the helicopter / plane – and that costs quite a bit more and involves filing paperwork with the FAA. Whenever I’ve traveled abroad – these units needs to be shipped overseas, and you need to ground the helicopter for a few hours before the flight and after to mount and unmount these larger devices for example – it’s an ORDEAL. With this unit – it fits in a carry-on case! When you’re ready to shoot, you secure the ATM on the back of your car / truck / helo / boat other with straps/other safety devices – and you’re pretty much good to go. No FAA paperwork – no headache. The unit runs off of the KS-8 batteries or can run off high AMP AC power from your vehicle/aerial platform. And one more thing: I recently spent a great week with 14 students/colleagues at the Maine Media Workshops to show them some of the ins and outs of filming with the Canon 5D MKII. I’ll mention some of the other gadgets that I introduced them to in future posts – but the ATM ending up playing a pretty key part of the final resulting video. Here is a link to that video (you’ll in effect see some of the above shots in full 1080p HD) – and keep in mind that many of these students had never worked on a video production before – to many this was the first time that they were asked to work as a team, to quickly develop a screenplay, to direct, light, DP, produce, record audio, edit, grade – not to mention that they had to learn each piece of gear and how to use it correctly! We really covered a tremendous amount of ground in less than a week. I’m really quite proud of what they pulled together. We spend 2 and a half days shooting together in the end- and edited a piece together just in time to make the final show on the last evening of the workshop. I highly recommend the Maine Media Workshops to anybody interested in sharpening their skills in either still photography or film. P.S. If anyone in the Los Angeles area is interested in trying the ATM model out – I’d be happy to rent it out. Heck I might even ship one out if someone from outside of the LA area is interested. Let me know. Holy cow. First off, the piece itself is great and these students did a great job in a week no less! Yea for them! I’d really love to know in advance when your doing this. I bet you broadcast this early but I missed it. I don’t want to do full motion but want to learn more about multi-media i.e., still photographs, Film (motion) and voice-over with B-Roll. @Tom, Tom – so I should be clear that almost all of the courses that I reach are much more centered around film / shorts / narratives. I’m not sure the 5D MKII is best suited for docs at this point – when they put audio levels, timecode, headphone jacks and a better way of focusing while recording in there – then I’ll be all behind it… You should check out the NPPA’s Multimedia seminars and the Platypus Workshops for what you are currently looking for. First of all thanks for the posts – I’ve really enjoyed hitting your site up. This rig is amazing! are they in production yet? We are planning a shooting November to the Marshal Islands and will be doing a shooting off of boats – I’ve been struggling as to how we can get clean shots on the open ocean, this looks like the solution. If you are interested in renting please let me know. We are based in Canada. @shaun, Yep – they’re in production. I believe you’ve had a chance to contact Arnie about a rental. I’ve heard a lot about some very cheap options for hand-held 5dmkII video shots – like go to your local hardware for $15 kind of cheap. Is there something usable that’s under $100? @Vincent Laforet, Actually we built our own rig for under 200.00 in parts and it holds 2 Kenyon Gyros. It works FANTASTIC. We’ve had it in cars , planes trains and boats with up to 25lb camera rigs, DSLRs to HPX300. You can check out a video we did that compares the gyro rig to a fixed camera. We are currently using it on a feature film. Check it out on vimeo at:http://vimeo.com/10712954 and I’ll share the info on the rig with anyone who needs it! THANK YOU FOR ALL YOUR GROUND BREAKING DSLR work Vincent! You’re more than welcome – and thanks for taking the time to let us know! @Angel Conde, It is – but it’s SO INEXPENSIVE – relative to the other products out there. You can never lose sight of that. That being said – in this economy – everything seems more expensive these days doesn’t it? Great post about gyros. You can rent Kenyon gyros from LensProToGo for very affordable weekly, fortnightly or monthly rates. Certainly a lot more practical than buying one and using it a couple of times a year! great meeting you at the collison conf. i spoke to arnie at aerial exposure last week about the ATM. He refered me to Blue Sky aerials up in the bay area to check it out. since you are next door in MB, i would love to take you up on your day rent offer. how is the end of next week for you? watch for a copy of gerry lopez’s book coming your way. great pipeline stories. @David Harry Stewart, sure – contacting you directly. Arnie has two dealers in the US, Blue Sky Aerials in San Francisco and Oppenheimer Cine Rental in Seattle. We both carry demo/rental systems, both of the new ATM and the larger LSG (capable of full size HD cameras and even some 35mm film cameras). Both Tom and I rent and sell these units, so if you’re in the western US or western Canada, let us know and we can both support your needs. @Fernando Guerra, The Merlin works well w/ the 5D MKII- most steadicam systems work pretty flawlessly as a matter of fact! A steadicam is a very different beast than what you’re seeing here – while you can mount a steadicam to the hitch of a truck or put an operator in one – it’s really not the same solution at all. I can not help but notice a jitter, or line go through the footage in many 5D MII shots with there is reasonable movement…I have read this being due to the sensor, and notice it also happened in the clip of the girl running. It would be easy to pass this off as a codec issue, but I have seen it do this straight out of the camera…I don’t see how this is acceptable quality. Can you provide your opinion on this please? You know if in italy ther is someone who rent gyro stabilizer? I think no..why here all it’s so difficult? Arnie has made interesting mounts for quite a while. I know two helo pilots who have four Ken-Lab gyro rigs from Arnie. One gyro on the X axis, one of the Y Axis and two on the Z access for super stability. Ron Chapple has a similar rig for HD video that he uses on a pick-up truck and as a front mount for an A-Star. Thanks for the letting the cat out of the bag! And sharing this great tool … did you use a jib on those two shots: crane up on car and crane up as she runs down to the bay. Bet you would have loved this rig on “Reverie”? Is it similar to the one you used in the hand-held shots when he grabs the flowers? Unreal…. I’ve drooled in the past, but i don’t think i’ve ever drooled this much in one blog post. And honestly, a 12K investment is peanuts when compared to the opportunities it potentially opens up for a filmmaker of any kind. Thanks for sharing, absolutely fantastic. where I am gyro pita are much cheaper, believe me. I am going to ask a stupid question. Forgive me about it… In the country runner shot I was impressed not just by the smoothness of the movement, but by the way we could hear perfectly the runner breathing but no trace of the truck sound or the sound of its tires on the road or the metal sounds that could possibly come from the truck bed. I’m really fascinated by all the new prospects!! Lo and behold! … And happy new year. Vincent – Just checked out your rig – great stuff. Is the offer still out there to rent in the LA area? If so, please email me. i`m felipe, from curitiba south brazil. please, to do the truck shot above, could it be done with only one KS-8 gyro? The ks-8 isn`t for a 8 to 12 ponds? how difficult is to mount the ATM? how long it takes? by the way, i love your job!! i tested the kenyon and noticed that it’s very very loud. Is there anyway to muffle this noise? How did you over come this problem? That’s the ONE negative to it from being an every day tool – no way to muffle the high pitched whine of the Gyros..
Great stuff! I’m in the Los Angeles area and looking to rent the ATM or something similar. Would love to rent from you if the offer is still available, otherwise do you have any rental house suggestions? Thanks! Hi I’m a film maker in LA as well. would love to get the same information from you as Jim. Looking into testing out some sort of steady device on a fast moving vehicle. Question. Do you think a 5D would do a great job used on an aerial exposure rig in a helicopter? My main concern is the rolling shutter in the 5D MKII vs. a larger chip CCD in one of my video cameras. By the looks of that pot hole footage in the street it seems like the stabilizer rig did a good job safeguarding the camera from violent motion that would bring attention to a rolling shutter. Your opinion would be greatly appreciated and will be helpful to a flight I’m shooting in a couple days. I’m really impressed with the ATM’s results. I’m living in Turkey and I was looking for a reasonably priced gyro stabilized platform for aerial video and photography. I know that you have a lot of different experiences with 5D Mark II. I thought you might give me some idea about where to start. I want to control all three axis (I can accept two axis if it becomes mandatory)apart from stabilization with gyros. Do you think that I can find a product that I can combine with ATM. A three axis gimbal for example. I would be appreciate for any kind of help. Thanks. I’m in the LA area and will be shooting aerial footage soon using a 5D and this peaks my curiosity. Let me know if we can connect offline to discuss further. Je souhaiterais louer un gyro pour une prise de vue depuis un hélicoptère. A qui dois-je m’adresser en France ? i have a job coming up now and would be keen to use the ATM. with the 5DMK2. Great post. I used to be checking continuously this blog and I’m impressed! Extremely helpful info specially the ultimate phase 🙂 I handle such information much. I was seeking this particular info for a very long. Thank you and best of luck. Which ATM Gyro will be suitable for the Sony HXR NX5E and where will it be available in Europe? This is a pretty sweet rig for the price. Thanks for any other wonderful post. The place else could anyone get that type of info in such a perfect means of writing? I have a presentation subsequent week, and I am at the look for such info. I’m just coming across this post as I’ve been searching the web about the ATm Kenyon Gyros. I”ll be doing some aerial footage with the gyro and was wondering if the ks-6 would be suitable for that. I’ll be shooting with the 5D. I’ve been reading around and some people actually suggest using two KS-8 gyros. Also, I saw that on lensprotogo.com they have the KS-6 available. also. Im writing from Dubai. Just about to get one of these (used unit). Thanks for your review and the insight you provided. Last min, but we are looking for gyro like the one you have for rental tmrw. We tried to call blue sky areal but they didn’t answer. We are in LA. Please let me know if it is available and your phone number if you get this on time. Thanks. Are you currently in Los Angeles? I am interested in renting the ATM out for a shoot this weekend. Let me know if this is available.